Looking for our posts about decorating your house or doing a renovation? Then you’ve come to the right place, this is a collection of all our decorating and home reno blogs. Have you ever walked into a room in your house and thought “I hate this room the way it is.”? I felt that way about my living/dinning room from the day I moved into my house. A year and a half of living with a room that I never used because I hated was enough. My husband I finally renovated the living room, dining room and it looks amazing. It was a lot of hard work but totally worth it. Doing a big renovation like this isn’t for everyone but if you are interested in trying it for yourself here are some pictures of the process, places you can rent tools and books and DVD’s to help you make any room into your dream room. The first thing we did was paint the whole room and put up the decorative trim. Even this alone made the room look 100% better. The book New decorating with architectural trimwork by Jay Silber helped us find the look we were going for and it helped us figure out how to get that look. Once you get the hang of how to do it, it’s really no that hard. The next step was for us to take up the carpet. This was way more work then I had imagined, I thought you could just pull up the carpet and the underlay and go on your way. No you then have to pull out the million staples that hold the underlay to the subfloor. 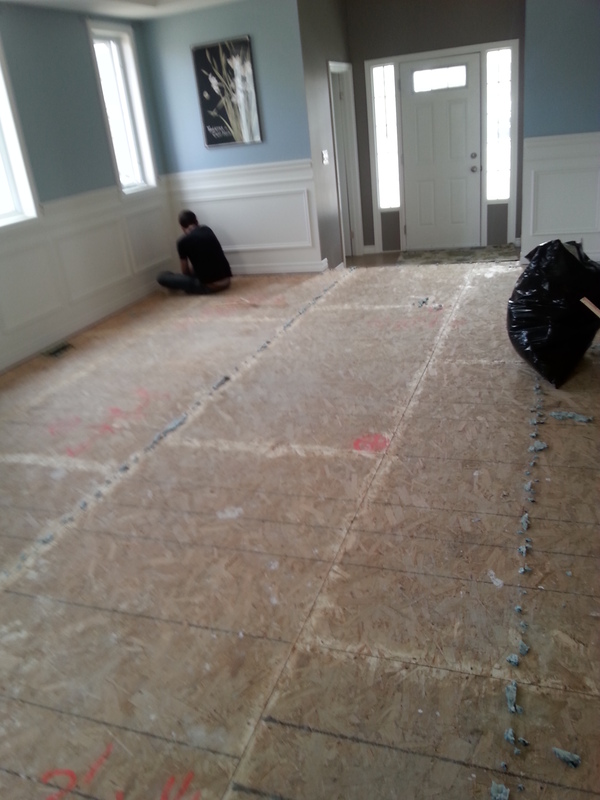 I do have to admit even the subfloor looked better than the carpet that was there. Finally it was time to put the new floor down. We looked at Installing & finishing flooring by William Perkins Spence a DVD called How-to DVD guide to flooring and the book The complete guide to flooring to help us narrow down the type of flooring we wanted and how to install it. Don’t worry if you don’t have all the tools to complete your renovation, Home Depot rents out tools. They even offer workshops if you want some hands on learning before you try something at home. 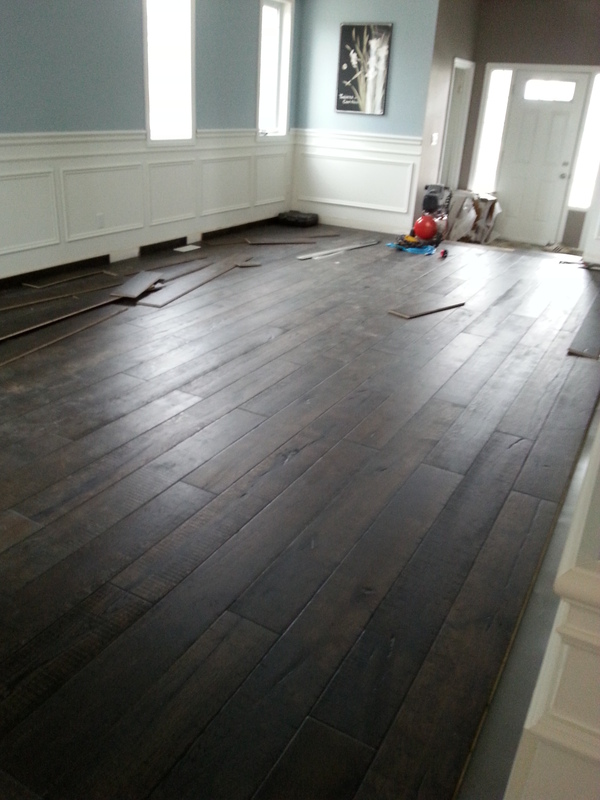 This entry was posted in Decorating/Home reno, DIY and tagged DIY, flooring, home reno, Painting, wall treatments on December 7, 2015 by gplrachel. The holidays are almost upon us and I’m sure most of you have started or are thinking about doing some holiday crafting. I know I like to bake holiday cookies to give as gifts but I would also like to make other things as well like, sweaters and homemade bath products. Giving handmade gifts over the holidays is a great way to show your loved ones how much you care for them. Do you have all your crafts done? If not, don’t fret there is still time to get all your crafts finished. I’ve made a few list of books that I like to use from the library to help you make a wonderful handmade holiday season. Check out the catalogue for more titles. This entry was posted in Children, Crafts, Decorating/Home reno, DIY, Family Life, house, reading, The Kitchen and tagged baking, Christmas, handmade gifts, holiday baking, holiday knitting, holidays, Knitting on November 18, 2015 by gplrachel. Once the summer is over and the kids are back to school I have the itch to do some decluttering and organizing. I have always wondered if a professional organizer would have some new ideas on how to keep the clutter at bay. If you are looking to hire one, check out Professional Organizers in Canada . I am currently reading The life-changing magic of tidying up the Japanese art of decluttering and organizing. This book provides practical tips and is based on the idea that possessions are full of feelings and energy. It provides detailed guidance for determining which items in your house “spark joy”. I am not sure if I agree with everything in Marie Kon’s book, but I have found a few gems of advice and inspiration to do a “whole house” declutter this fall. This entry was posted in Decorating/Home reno, Family Life, Self improvement and tagged declutter, house cleaning, organizing on September 14, 2015 by gplglenna.